Assembling the first issue of Willawaw Journal presented me with several technical challenges and a steep learning curve, but my efforts were deeply rewarded as I read and reread each of the poems; I did not tire of them nor of the rich imagery of the artwork. I am pleased to report that this issue of Willawaw is representing work from Oregon, Alaska, and Australia. I look forward to expanding our reach as our calls for submissions spread nationally and globally. I appreciate the professionals in my poetry community who help to spread the word. This includes you, too, dear reader. If you like what you read within these pages, please tell your friends! The responses to Peter Sears’ prompt were many and varied, but it seems most of us could reach back in time to our child selves and discover something new. Barden, in Over the Horizon, climbs the tallest tree to imagine the world awaiting. Stone leads us into his grandmother’s early memories of life in the Midwest in The Power of Place. White brings us starkly into the eye of a hurricane in her portrait of her mother, Louise. Edelstein takes us to the Kansas prairie where the speaker leads urban students into the bluestem, Field Trip to Konza Prairie. Others responded to the Over Seventy part of U20O70 theme with thoughts on loss, death, and aging. Goetze writes about Missing My Sister: “It’s like pulling up your winter pants,/so loose-fitting they almost slide off your hips;/last year you lost—not knowing how—pound after pound.” Burke greets the limitations of aging, exchanging the Grand Canyon for cracks in the sidewalk, in his Daily Pleasures. Darling experiences her drift into her senior years as an Uninvited lover who “presses cross-stitch on my cheek,/weaves silver through my hair,/ tucks pads around my waist,/ reshapes me as I sleep.” And finally, Rokoff-Lizut personifies Death as a hooligan, a reckless driver who exchanges his Dodge Ram for a Porsche, in Suppose Death, driving a Black Dodge Ram. Read their poems to discover their wonder, humor, and humility. The Under Twenty call brought to us very little poetry that felt fully-formed. We have included one young emerging poet, Cassidy, who voice begins to peak through her short poem, Solo Time. On the other hand, in the artwork, we found some extraordinary work from the students at Howard Street School—pastels, watercolors, and mixed-media. (If you click on each piece, you can read the caption and go to a larger image.) The subjects ranged from political, to pastoral, to literary and surreal. 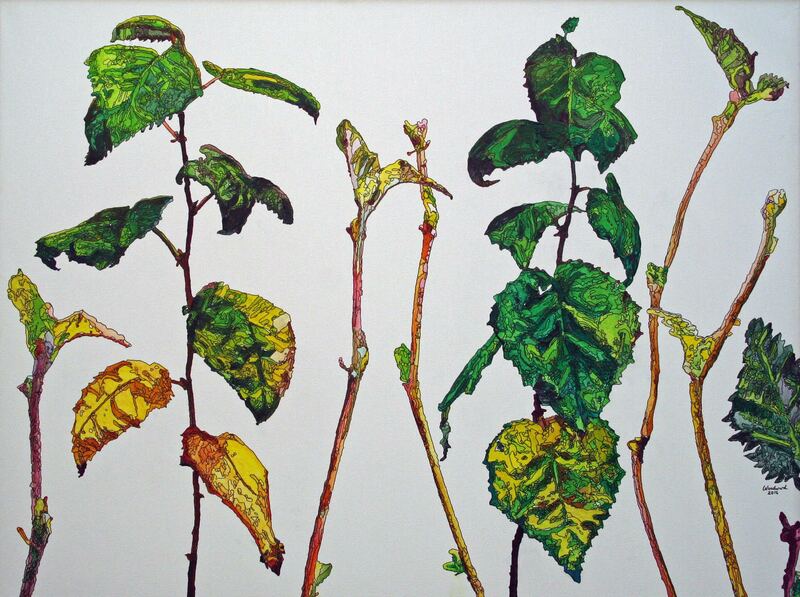 As for our established artists, Woodward wows us with his close-ups of saplings (cover art) and budburst. Be sure to read his comments about his work which are on the last page. Martin celebrates her return to porcelain with a sgraffito platter and two teapots. Her notes, which you will find below her teapots, are also a good read. Meissner tantalizes with her enigmatic “Reliquary #5: Theft,” a quilted piece that will knock your socks off. One other artist, new to me, Algate (in the over seventy category), is also returning to a medium she hadn’t used for a long time—her painting, Just Getting Started, says it all. As Chuck Wendig just reminded me in his post on Terrible Minds, don’t dismiss what you do, whether it is making stuff or writing—or reading—just do it. This is how we evolve, one mind at a time. We make room for what matters. I invite you to take yourself on a treasure hunt through these pages. Additional contributors await your discovery. Collect them with nets and put them in jars laced with dimethyl ketone. The eight graders stumble out of the yellow bus. They wear tank tops and short shorts. the docent demonstrates the correct method. never stood in the midst of the prairie before. She sweeps a net in figure eights through tall grasses. The children never stood in the midst of the prairie before. They jitter and whine about itches and spiders. The girls sweep nets at the edge of the grasses. “I’m not going in there,” Tyesha grabs Lashonda. They jump together and squeal about spiders and snakes. The docent says follow and walks into bluestem. to collect enough grasshoppers, put them in the jar. The girls run through the bluestem, shouting and laughing. They stop, look across open prairie. There are enough grasshoppers in kill jars. They smell the wind on the grasses. It seemed like some sort of destiny when Judith Edelstein moved to Manhattan, Kansas. She lived there from 1987 to 2006, longer than in any other place. After retiring from the public library in 2001, she volunteered as a docent with the Konza Prairie Environmental Education Program and set about studying poetry. She now lives in Corvallis, Oregon.